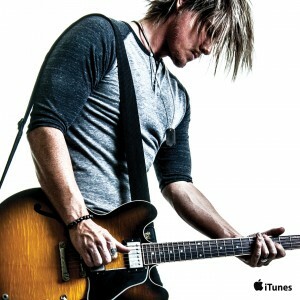 In a track by track video series, songwriter/recording artist Aaron Hendra describes the inspiration behind the song Alive, from his debut album OCTOBERSONG. It was early August last year and I anxiously pushed an overloaded airport cart with seven items of baggage to the Qantas international check in desk. 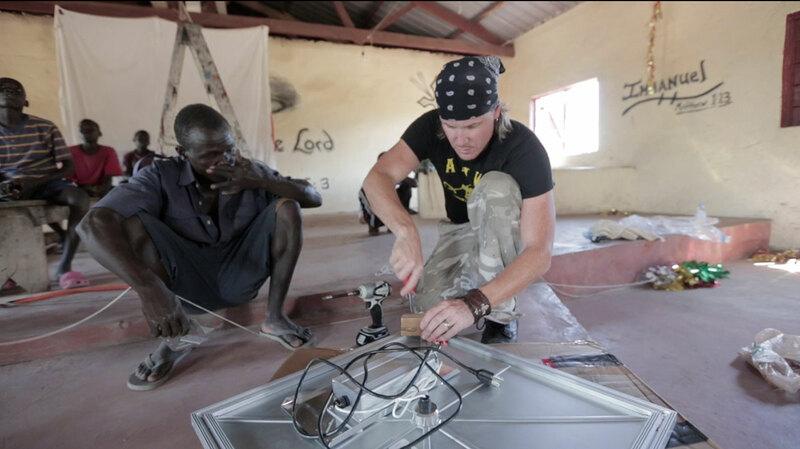 I was on the way to South Sudan with a with a very important item in my possession, a prototype LED light panel which I hoped to install in the mud brick church at the Machine Gun Preacher orphanage. It was 9.30pm at LAX and I wasn’t even sure if I had a seat, I was flying standby to save a few dollars. 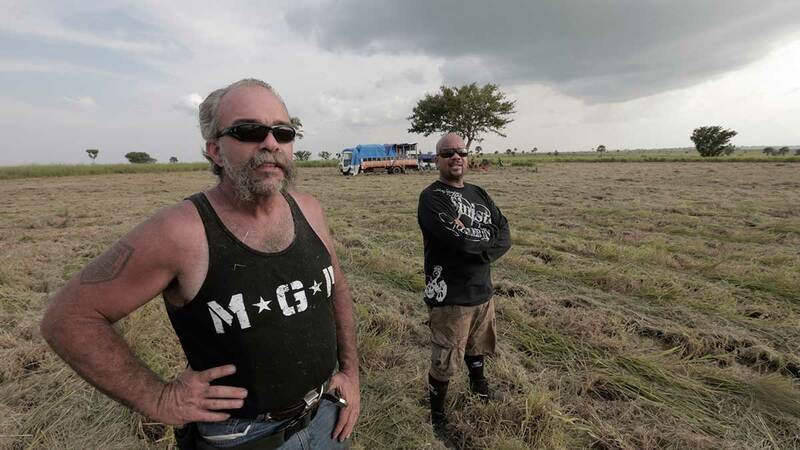 It was also imperative that I be at the MGP headquarters in Kampala, Uganda in 3 days to meet Sam Childers, Kevin Evans and Gigi otherwise the whole trip could be a disaster. 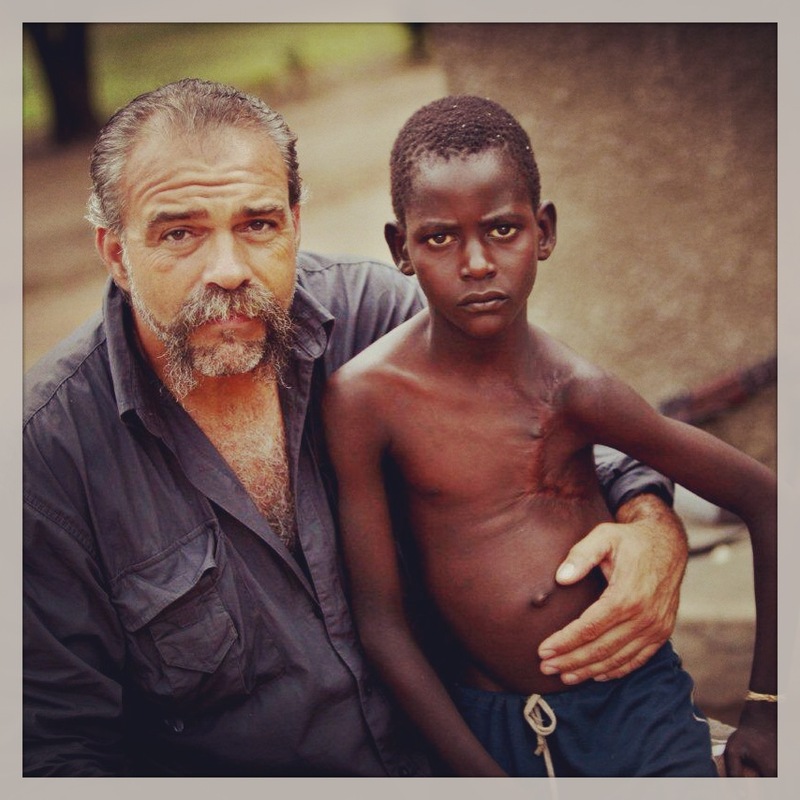 One thing about the Machine Gun Preacher is he doesn’t wait for anybody. I was feeling slight pressure at this moment. A guy at the Qantas desk called me forward with a very unimpressed look on his face. “How many bags are you checking?”, he asked. 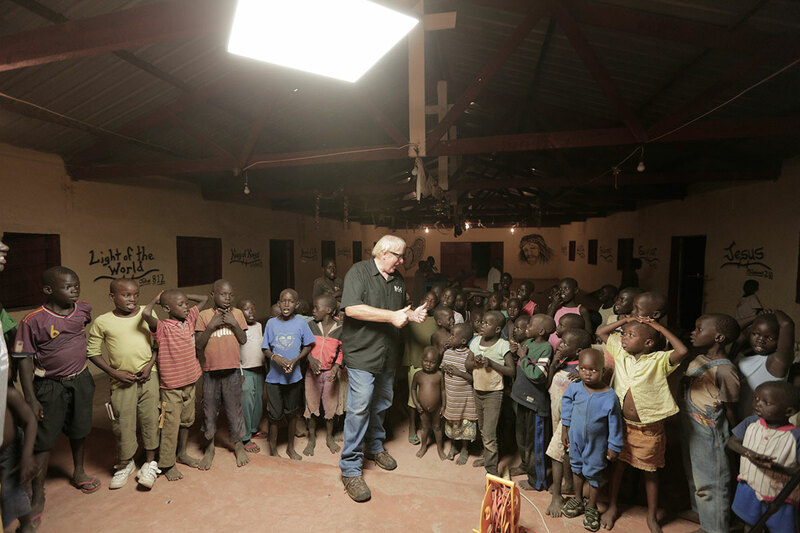 I began to explain that this was a humanitarian trip and I had a special light I was going to install at an orphanage. He didn’t seem to warm at all and said I would have to check four bags. $800US for just the first leg to Melbourne. 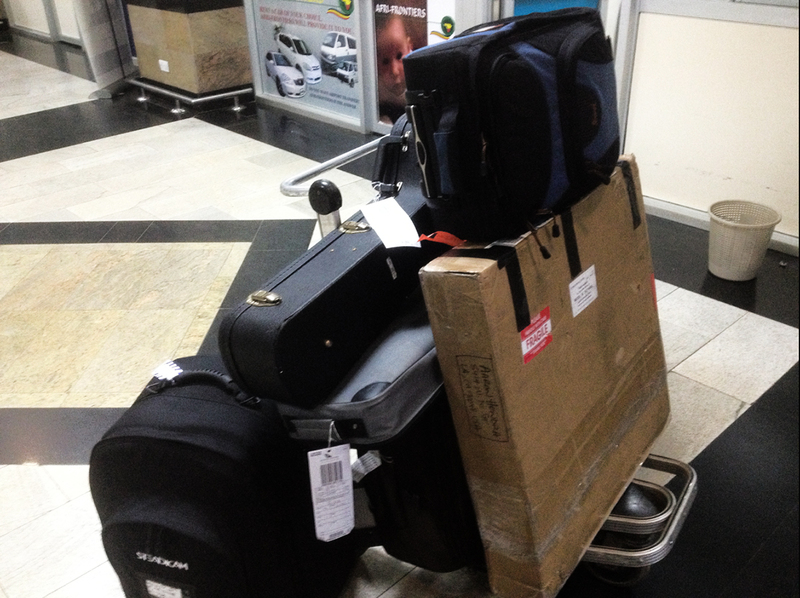 This could cost thousands in extra baggage fees by the time I got to Uganda and my heart sank. It had been a journey of faith just to get everyone onboard and behind this new idea of bringing efficient LED lights and Solar power to the Children’s Village. I’ll never forget the shouts of excitement when Sam started up the gasoline generator at dusk, the night of our first visit in 2010. That trip had been to record the children sing on One Man’s War, we were there for music mainly but the idea and possibilities of bringing clean energy and lights to their lives was born that night. There is no grid supplied electricity there, only one old gasoline generator. We heard the kids screams of excitement the moment the power kicked in and the light bulbs started to flicker in the dimly light church. For us it’s so easy to flick a switch but electricity in this part of the world is a luxury. The kids are incredibly smart and they love to study. Imagine if they could study and work at night time as well… the seed was planted that night. The original planning video with footage from our first trip in 2010. I quickly tried to consolidate my luggage. With some heavy duty duct tape I was able to kinda make four bags into two. Satisfied that this was the best I could do, I pushed my carts over to the standby area and continued praying and hoping I would get on the flight. After about an hour, the desk called my name. Hallelujah, I had a seat, but what was going to happen with luggage? He shook his head at what I had come up with. “You can’t do that”, he stated and walked over to his supervisor. They both then walked over to me as I pleaded my case again. After a few moments the supervisor gave instructions and walked away and I received the first of what would be many signs that I was putting my faith in the right direction for this trip. Qantas made me repack everything but only charged for one bag to Australia. Away we went. I flew via Melbourne, Sydney, Johannesberg to Uganda. I don’t have time in this blog to tell all the stories but let me just say it took every bit of charm and determination to get all seven bags to Uganda. 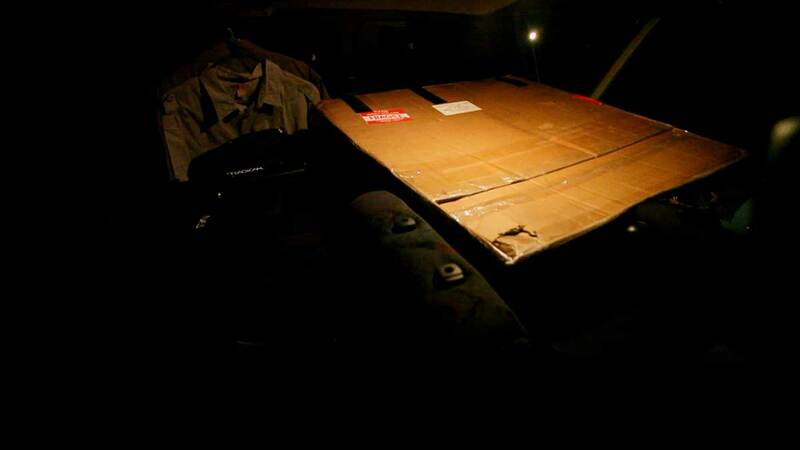 In the end it only cost a few hundred dollars in extra baggage fees. I reached Kampala on time and breathed a sigh of relief! We arrived at the MGP base in Kampala safe and sound and, after enjoying a few laughs with Sam and Kevin, Gigi and I settled down to map out the next leg. One of Sam’s guys was stuck on the South Sudan border driving a truck loaded with a new tractor for Sam’s farm. He had been detained for two days already due to a paperwork issue and as a result Sam’s schedule would need to change. He could no longer go to the orphanage with us and suggested Kevin and I take the little RAV 4 and fly up to Sudan right away. Gigi would not be able to fit in the car with the LED light, camera gear etc so he would stay with Sam and we would all meet up at the new farm in Northern Uganda in two days. This all sounded good except for one small problem. 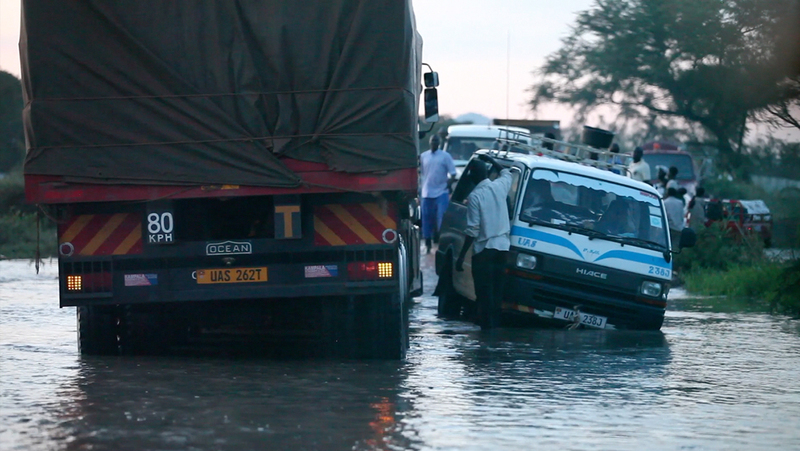 Apparently the last part of the road to the South Sudan border had been closed temporarily due to flooding. Again, we’re faced with a dilemma. Do we push forward and have faith the road will reopen in time? We decided to go and the next morning before light, Kevin and I loaded the small 4WD and departed Kampala. The weather was good for most of the day. We only really hit a few slow areas where big trucks had made a mess in the mud. The road from Gulu (Northern Uganda) to South Sudan is littered with massive pot holes and it’s actually so rough that it vibrates vehicles to pieces. We were making good time. All of a sudden we see rows of halted trucks, busses and lots of people out of the cars. It was 4pm by now and even though there was only about 30-40 km’s to go, the fact that more and more people we’re turning back and walking the other direction wasn’t encouraging. Another hour went by and contingency plans started to creep into our minds. It was at least four hours back to Gulu and, even though it’s safer now than 5 years ago, we really didn’t want to be driving at night. Time was ticking with no movement or sign of the road opening. About a dozen local police and army continued to block the road. Aware that the border was closing in less than an hour, Kevin who is a seasoned pro at navigating his way through Africa, expressed his fears stating, “I hate to say it buddy, but it’s not looking good”. 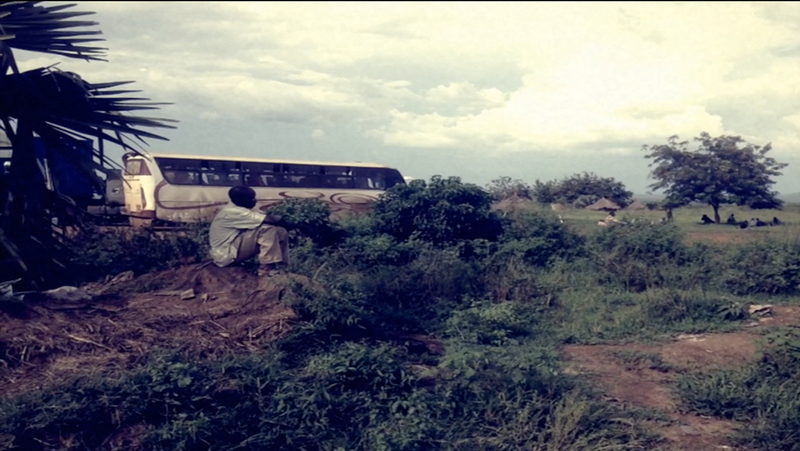 Waiting at the road closure in northern Uganda. Suddenly there is movement as one car darts through the road block and the police move aside. Several cars follow but it’s still uncertain whether we are good to go or not. We decide to move, anything is better than just sitting there, so we push forward. It quickly becomes evident why the road was closed. In parts, the road had become a river. There were lines of trucks stopped in deep water and people walking through 4 or more feet of flooding. We realize that even if we make it through, the border will be closed and Mr Magok, our border contact was not answering the phone. We pushed on. Treacherous roads nearing the South Sudan border. “I don’t believe it, I think I just saw Magok”, Kevin yelled as he pulled the RAV4 to a stop. Somehow, in all of this mayhem we had run into the very person, the only person that could get us across the border into South Sudan that night. I was blown away. That was a miracle! Magok rode with us the rest of the way, at points walking in front of the vehicle to make sure we could pass. At about 7pm we handed our passports to the border office, fully amazed to have actually made it to our destination. 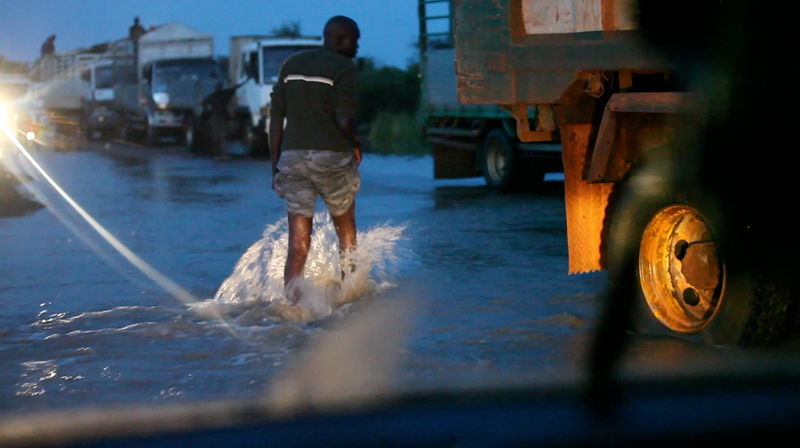 Mr Magok Majok (S Sudan Border Info Officer) leading us through the flooded roads. The next 24 hours were amazing. I got up early to film the sunrise and get shots of the orphanage. 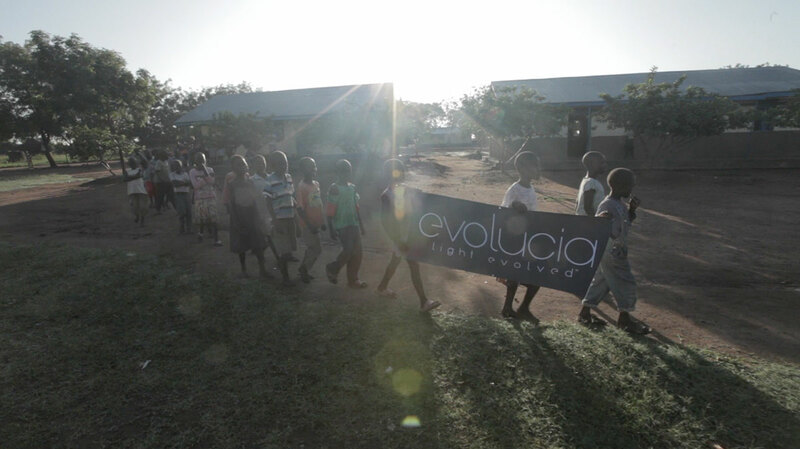 The kids weren’t sure what we were doing but they all got together and held the Evolucia banner, a symbol of what we hope to achieve with this project. A few of the lads joined in and were a big help installing the light and it was really great to work with them. For me, one of the absolute highlights of this trip arrived that evening when the children gathered in the church to see us plug in the LED light and turn it on for the first time. I really hoped that after bringing this fixture all the way it would live up to expectations. We were not disappointed and I have to say that the folks at Evolucia have done an amazing job. Not only was this fixture spectacular in terms of light quality and coverage, it only uses 65-70 watts and will last for 15-20 years maintenance free. To power the lights we are also raising funds to purchase and install a 5kw Solar Farm on the property. There is no shortage of sunlight and having clean, renewable energy to power lights and other potential tools and appliances is a very exciting and realistic goal. Local lads helping me install the Evolucia LED Light Panel. We did it, phase one complete and a success. To top it all off, it was Kevin’s birthday, so after a long day, we celebrated with some food at a local Ethiopian eatery on the main street of Nimule. I want to especially thank Kevin Evans for going beyond on this trip, we couldn’t have done it without him. Kevin is the cinematic genius behind the MACHINE GUN PREACHER visuals, videos and photography. This trip was a great testament to a guy who is so selfless that he would go out of his way, drive through floods and spend his birthday in the bush, all on faith. I take my hat off to you Mr Evans. Wishing Kevin a happy birthday. Thank you for taking the time to read this story. This project is dear to our hearts and we are determined to raise the funds needed to make this LED Light / Solar Farm project a reality. I am also extremely grateful to Evolucia Lighting for donating their resources and this LED light panel, hopefully the first of many that will be installed in the coming years. 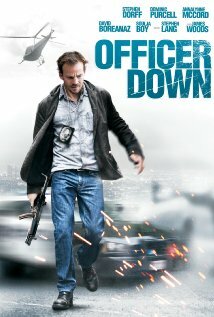 The track “Bad Machine” written and performed by Aaron Hendra for the movie “Officer Down” (Jan 2013 release) gets added to a growing list of film credits for the songwriter. This movie stars Stephen Dorff, David Boreanaz, James Woods, AnnaLynne McCord & Aussie actor Dominic Purcell from the hit TV show Prison Break. Not satisfied with just “Bad Machine, Aaron also contributed 2 other tunes to the soundtrack. He wrote “Arrhythmia”, a dance pop tune performed by European artist Kamaliya – watch the video here – as well as the haunting “When I Opened my Eyes” for the credit roll. 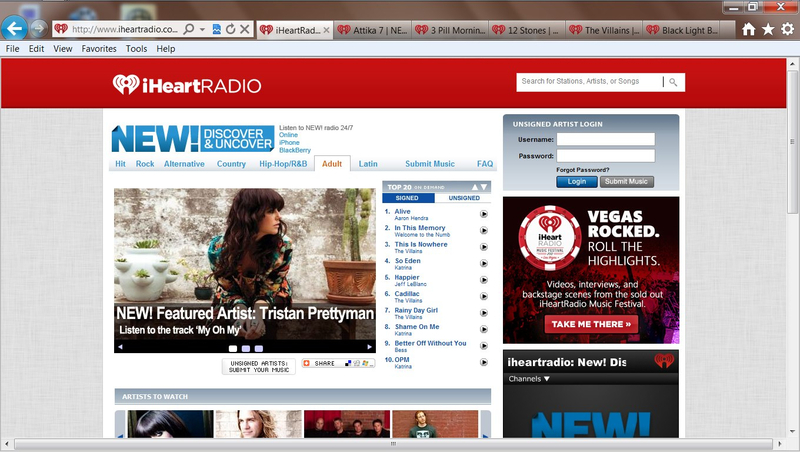 AHP’s ‘Alive’ officially hit the #1 position on the iHeartRadio new artist chart (AC category) today. More confirmation that this track has the goods to succeed on commercial radio! ‘One Mans War’, a song written by Aaron about the life and mission of Sam Childers AKA Machine Gun Preacher, was recently selected as a finalist in the Gospel Category of the 16th Annual USA Songwriters Competition. Click here to see the list of winner and finalists.